*Here’s a secret we don’t much like giving away: some of the finest weather and best scenery you’ll find anywhere in the country happens right around now, right near us in upstate NEW YORK‘s beautiful Finger Lakes. 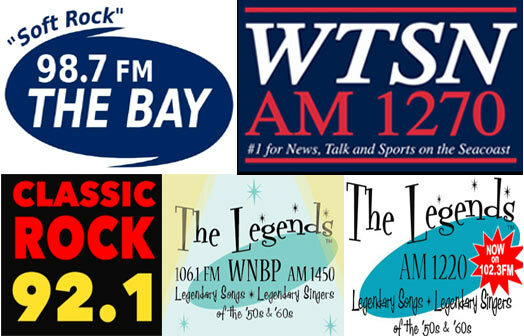 And if you’re lucky enough to get to spend some time up this way, you’ll hear some different sounds on the radio now that Alan Bishop has taken over at the Finger Lakes Radio Group, where two of its FM signals swapped formats last week and a third took on new branding. And there’s a new lineup of airstaff as the stations move from syndicated talent and music to a much more local approach. At the Wall, the syndicated Bob & Tom Show is gone, replaced by Paul Szmal in mornings and Tiffany in afternoons; on Classic Hits 99.3 it’s Ken Paradise mornings and Mike Smith in afternoons; and on Mix it’s Jim and Mary in mornings (with Jim Schreck tracking solo 9-noon), Sorah in afternoons and John Tesh after 5. *How do you compete against big groups like iHeart and Townsquare in a relatively small market like the NEW HAMPSHIRE seacoast and neighboring communities? The answer, at least last week, was for several veteran broadcasters to join forces, assembling six stations in three states into a single company to be called Coastal Media Partners. *When we think of VERMONT broadcast owner Ken Squier, it’s generally in the context of his WDEV and sister stations. 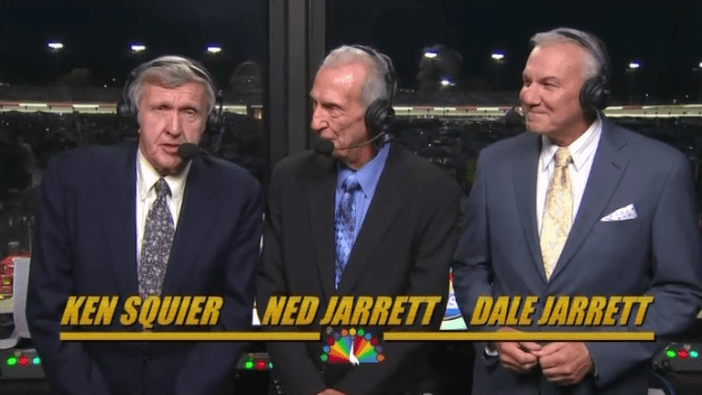 But Sunday night’s NBC NASCAR broadcast from Darlington brought Squier back to the network broadcast booth for “Retro Night,” accompanied by Ned Jarrett and his son, Dale Jarrett. While we might (and do) quibble with the accuracy of the “retro graphics,” there’s no quibbling with Squier, who was as smooth as if he’d just called his last race a week ago instead of several decades back. *In MAINE, there’s word of the death Sunday of Chuck Morgan, veteran programmer, producer and VO talent. Born in Worcester as Bob Michaud, he worked locally at WAAB/WAAF, WVBF and WEIM before coming to Portland as air talent and production director at WJBQ in the 1980s. Morgan then went solo with his Morgan Media production business (responsible, among other things, for the “Yankee Report” with Bob Scott, not to mention innumerable commercials and promos). He eventually relocated to Fort Myers, Florida, where he returned to radio at WOLZ (95.3). *There’s a format change to kick off our news from eastern CANADA: on Friday, Evanov dropped the “Energy” top-40 format from CKHZ (103.5 Halifax), flipping the station to “Hot Country 103.5” in a direct attack against Maritime Broadcasting’s top-rated CHFX (101.9). The move pulls CKHZ out of what had become a crowded pop market, including Bell’s CJCH (101.3 the Bounce). Ontario’s My Broadcasting didn’t waste much time starting some format makeovers after it took control at Cobourg-based Pineridge Broadcasting. As of noon on Wednesday, the AC “Magic” format at CJWV (96.7 Peterborough) has been reborn as “Oldies 96.7,” with what My says will be an increased emphasis on local news. And in Cobourg, RadioInsight picks up on a domain registration for “Classic Rock 107.9” at what’s now AC “Breeze” CHUC (107.9). *In Montreal, Cogeco isn’t waiting for the CRTC to let it turn the old CINF (690 Montreal) transmitter back on to broadcast a provincially-subsidized all-traffic service. Instead, it’s flipping CKAC (730 Montreal) to all-traffic, starting tomorrow. While Cogeco blames competing broadcasters for slowing things down with their own applications for 690, media blogger Steve Faguy notes, quite correctly, that the company simply concluded (probably correctly) that it could do better with the guaranteed provincial subsidy for all-traffic than with whatever ad revenues were coming from the French-language sports programming that has been on CKAC for the last few years. The sports end tonight, several CKAC personalities move to sister station CHMP (98.5), the traffic starts tomorrow on 730, Cogeco has dropped its application for French traffic on 690, it continues to push for quick action on its application for English-language all-traffic on the former CINW (940) – and with CKAC gone to traffic, we can pretty much write the obituary at this point for mass-market French-language AM radio in Quebec. *In Albany, it’s active rock in place of adult hits at WKLI (100.9), which flipped from “The Bridge” to “Rock 100.9” over the weekend. *In Philadelphia, it’s “Mike Vick Radio” on WPHI-FM (107.9 Pennsauken NJ) as the Eagles star “takes over” the signal for a few days of stunting as Radio One prepares to launch a new format there after moving the signal’s former adult R&B programming and WRNB calls down the dial to the former WPHI-FM (100.3 Media). Meanwhile, CBS didn’t wait as long as it had planned to put sports on FM; the new WIP-FM (94.1) signed on Friday, displacing WYSP’s rock to 94.1-HD3. *As a general rule, we here at NERW don’t get too excited about format-flip stunts, especially when they’re on little rimshot FM signals in upstate NEW YORK. It’s been a little over two years since Clear Channel executed a signal swap that moved classic hits “Fox” WFXF, the only format that had ever really been successful on 107.3, over to the much bigger 95.1 Honeoye Falls signal. The 2004 swap landed modern rock “Nerve” WNVE on 107.3, where the format couldn’t even reach most of its former core audience close to the city of Rochester. Without Howard Stern, who’d been dumped from the 95.1 incarnation of Nerve in April 2004 as part of a larger Clear Channel corporate dispute, WNVE didn’t have much going for it, and in recent months it ran almost completely automated, with just a handful of voicetracks and no live jocks. So it was no big surprise when, with no fanfare at all, the plug was pulled on the Nerve last Wednesday night at midnight. What was a surprise – at least to some extent – was the stunt format that replaced it – “Huge 107.3 FM,” a stunt with a sponsor, Fucillo Hyundai. Fucillo has made a name for itself in other upstate markets with a saturation level of advertising that all but ensures that anyone watching TV, listening to the radio or seeing any outdoor ads is exposed (repeatedly) to its “Huge” slogan. Fucillo says it’s struck a “seven-figure” ad deal with Clear Channel to launch its new dealership, and “Huge 107.3” appears to be a clever part of that deal. In practice, it’s nothing more than the “spin the wheel of formats every hour” stunt that we’ve heard in plenty of other markets – the choices thus far have included everything from classic country to disco to “songs by people named Bob and Tom” – but this time, it’s all branded with the sponsor’s name, and it’s garnered a surprising amount of media coverage. Shakespeare it ain’t…but it’s certainly an amusing way to pass a long holiday weekend, and we’ll be listening this week to see what comes next at 107.3. *In New York City, Friday was moving day for Air America Radio, which moved from Inner City Broadcasting’s WLIB (1190) to Access.1’s WWRL (1600). WLIB relaunched Friday morning with black gospel, while WWRL retained its Sam Greenfield/Armstrong Williams morning show, followed by Air America’s Jerry Springer, Al Franken, Randi Rhodes and Sam Seder – but not Mike Malloy, whose late-night Air America show was abruptly cancelled last week. *In VERMONT, the Radio Free Brattleboro saga has finally come to a close with the debut of the station’s licensed LPFM successor. Vermont EarthWorks put WVEW-LP (107.7 Brattleboro) on the air last week, returning much of the community programming to the air that went away when a federal raid silenced the unlicensed RFB operation. A quick note from MAINE that the WCLZ calls have returned to 98.9 in Brunswick, though with no change to the “Point” nickname and modern AC-ish format that the station’s been using as WTPN. The interim home of the WCLZ calls, 95.5 in Topsham, is now WJJB-FM to match the sports simulcast with WJJB(AM) (900 Brunswick) and WJAE (1440 Westbrook). Greater Media’s Boston stations sorted things out this morning, and here’s where everything settled down: Country music stays at 96.9, but under the WKLB-FM calls that move over from 105.7. The jock lineup on the new “Country 96.9” is still unclear, but so far this morning, your NERW has already heard WBCS veteran Carolyn Kruse and longtime fill-in guy Bill Heckbert. Greater Media saves its million dollars this way, as long as they keep 96.9 country through the end of the year (and with no competition, why not?) Still missing at 96.9 is a strong morning show; we’ll see what pops up there. Over at 105.7, the new calls are WROR-FM, and the new format is being officially described as “60s, 70s, and 80s.” What it really sounds like, though, is another oldies station in town, with a smattering of 70s and 80s soft AC and without the 50s music on Boston’s established oldies outlet, CBS’s WODS (103.3). The key players here are morning veterans Loren (Owens) and Wally (Brine), who also picked up WBCS’s Tom Doyle along the way. The strategy? Seems like Greater is trying to bracket its big AC, WMJX (106.7), while taking a bite out of Oldies 103 at the same time. It’s nice to hear the WROR calls back in town; that’s where a lot of this music was first heard in Boston, in the old 98.5 days. Radio with pix: Boston’s CBS-owned WBZ-TV took on a new identity one day ahead of schedule on Monday, becoming “News 4 New England” with a new set, a new logo, and almost no mention of its calls…New Bedford’s WLWC (28) should be on the air soon. They’re advertising for staff in Broadcasting and Cable, confirming the speculation that they’ll be in an LMA with NBC’s WJAR-TV (10) Providence. And WRKO talkers Pat Whitley and Marjorie Clapprood are back to radio-only. New England Cable News has dropped its telecast of the 5:30 to 7am portion of the show in favor of its own morning newscast. Hi Scott.I believe the new owners at The Grand 92.9 are Durham Radio. Right you are! Thanks for the correction – I’ve fixed it. I’m amazed that you missed one of the BIG stories in the Southern Tier: Angelica’s WRAQ-LP (92.7) got their license to cover on August 29th and are on the air. It appears to be mostly syndicated music shows (on Labor Day I heard British announcers with country and then jazz). If I’m not mistaken, they are required to do a certain amount of local and live programming each day, but we’ll have to see what happens. Their 100 watt Horizontal only signal gets to Belfast pretty well – even on my car radio – and the fringe signal would appear to get just into Fillmore and down to Scio, but not quite to Wellsville. Biggest thing to hit the area since WJQZ moved from 93.5 to 103.5 some years ago. I don’t know the dates but “WCVB consumer reporter” Paula Lyons eventually went on to ABC’s Good Morning America as a consumer reporter and, after a number of years, came back to Boston and joined WBZ as a consumer reporter (WCVB already had Susan Wornick who had replaced Paula Lyons). And Paula might have been a consumer reporter at WBZ for longer than she was a consumer reporter at WCVB.